My this makes me hungry. Trying to stay away from carbs? 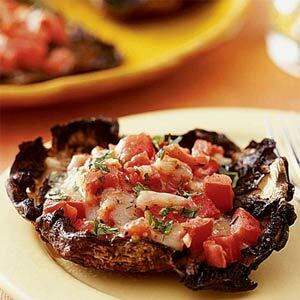 How about Tomato Bruschetta on a Grilled or Oven Roasted Portabello. Clean the mushrooms by wiping with a towel. Remove the stem so you have a flat mushroom cap with plenty of “bowl” space. Marinade the caps for 2 hours to overnight in your favorite vinegar oil dressing. Heat oven to 400 degrees and bake mushroom caps for 20-25 minutes until tender. Top with Tomato Bruschetta and a thin slice of parmesan. Remember to use the baby portabellos if you are making for appetizers. This entry was posted in Appetizers, Eat your vegetables, Vegetarian and tagged Bruschetta, Portabello mushroom, Tomato. Bookmark the permalink.